We suggest you get started with a personalized one-on-one private surf lesson. It is the most effective way to learn to surf. You choose the time (subject to availability) and an instructor will be available for you to give you his/hers undivided attention. This is great for any skill level or age. Your private lesson will last two hours, starting with a land lesson and then with further instruction in the water. Before you know it you will be up and riding your first wave-your success is guaranteed ! In three to eight private surf lesson sessions, you will have a great introduction to surfing, which lays the foundations for a lifetime. 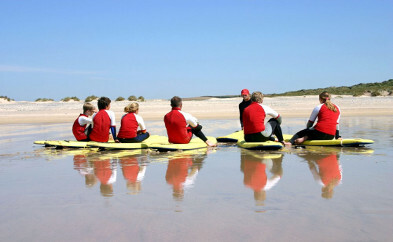 Our lessons will give you the confidence to handle yourself in the water and be on your way to a lifetime of surfing. We suggest you get started with a personalized one-on-one private surf lesson. It is the most effective way to learn to surf. You choose the time (subject to availability) and an instructor will be available for you to give you his/hers undivided attention. If you have two or more people in your group or would like to join a group, then consider a group lesson. These lessons are great for friends to learn together, corporate gatherings, or bachelor parties. Our small group settings will make sure that each surfer gets the most out of their lessons and our instructors will make sure you have fun and a safe surfing experience. For group lessons of ten people or more, please contact our office at (310) 946-0337. * All reservations are required to pay a Deposit. The remaining balance is due at the time of your lesson! Deposit is non-refundable. Want to wow your friends and family back home? Order a photo or video package when you book your reservation online and let our cameramen capture your amazing moves and style. Not too many people can say they have ever ridden a wave so preserve the memories forever with a photo or video package!